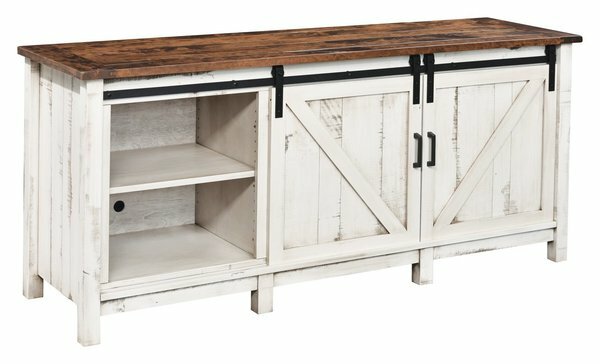 The sliding doors of the Amish Madison Contemporary TV Stand offer up a modern yet rustic look for living room, family room, den or bedroom. This gorgeous TV stand has sliding doors that reveal shelves and slide out drawers just perfect for storage. Keep favorite movies, photo albums neat and nearby in this gorgeous solid wood unit. Madison is shown here with a barn wood top. The base is shown in white paint with van dyke glaze. Madison can wear a rustic or contemporary look, depending on the wood type and finish options you select. Amish made furniture lets you get in on the design with custom options to choose from. Please email or call us with any questions. Thank you for shopping DutchCrafters.